Campaigning for people to be heard. Since leaving City, Emma Barnes has been able to combine her passion for campaigning and political influencing with her love for speech and language therapy and desire to help others. Emma is campaigning to protect vital services for people with speech, language and communication needs. 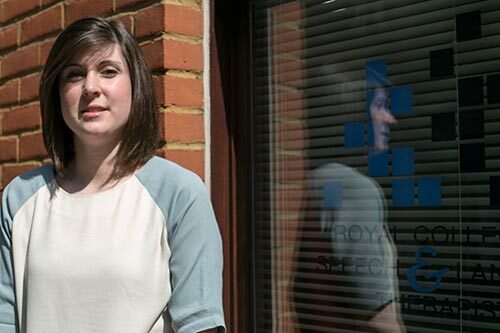 She studied Health Policy at City, University of London and works at the Royal College of Speech and Language Therapists, where she is running the Giving Voice campaign, a UK-wide initiative to raise awareness of speech and language therapy and communication difficulties. The campaign aims to increase understanding of the vital importance of speech and language therapy, which is threatened by funding cuts. Specialist help can transform the lives of people with communication difficulties. It can also save the government money by helping people access education, go back to work and leave hospital safely. She emphasises how important it was for her career to develop her campaigning skills through her work as a part-time officer on the Students' Union Executive Committee. In her final year at City, she was awarded the Outstanding Contribution to the Students' Union award and a Silver Carrot award for contribution to student experience. Emma says: "The support that lecturers and staff at the Students' Union gave me to combine a challenging degree with a busy Union role was invaluable in helping me to gain the skills I needed to be a campaigner." "Find out what you are passionate about and shout about it, use extra-curricular opportunities and get involved with everything happening at City" is Emma's advice to City students preparing for graduation and their professional lives. Find out where City's Health courses could take you.